I asked Fiona to guest-post today because even though she loves to travel to Spain and Portugal she is actually Irish lassie living in Ireland. I thought it would be fun to get insight into what St. Patrick’s Day is like there, sort of like getting it from the horses mouth, something like that, but less insulting, as Fiona is definitely NOT a horse! As much as it pains me to admit, in reality, the truth isn’t actually THAT far off… In Ireland on March 17th we all embrace our inner leprechaun, to some extent anyway. Whether it’s attending a local parade of dolled-up milk-floats, swaying along to a rendition of Danny Boy gone wrong or settling down in a green woolly jumper to enjoy a hearty feed of salty boiled ham and cabbage, St Patrick’s Day definitely heightens the sense of “Irishness” in all of us. If it were any other day we’d probably run a mile from all this twee commercialism, but like Brussels sprouts on Christmas day, these Irish-isms feel like a good idea at the time. So what do we like most about St Patrick’s Day…? Bye bye work: In Ireland, St Patrick’s Day is a public holiday so most people (except of course, the nation’s bar workers) enjoy their first legitimate day off work of the year. Bye bye winter blues: With a welcome stretch in the evenings (clocks go forward on March 27th for summertime), Ireland is full of the joys of spring – bright yellow daffodils, fluffy lambs and sunnier, warmer weather. Bye bye Lent: St Patrick’s Day normally occurs in the run-up to Easter, so it usually coincides with Lent. Luckily for the Irish, Saint Patrick’s only claim to fame wasn’t just ridding Ireland of snakes. When not chasing adders and pythons away apparently he took some time out to decree that March 17th would be a Lent-free zone. On St Patrick’s Day, anyone who has forsaken alcohol, swearing or junk food over Lent gets to fall off the wagon, guilt –free, for 24 hours. Cue the nation’s pub owners rejoicing! Dublin hosts the biggest St Patrick’s Day parade in the country. Every year there is a different theme, usually linking the present with the past. The family-friendly parade features an impressive range of international acts, from baton twirling majorettes and giant papier mache puppets to high school marching bands all the way from the US of A. For those who don’t make it into the city centre on time, the whole event is televised live on the national television station, RTE. This mass Irish dancing event takes place in an historic Georgian terrace in Dublin city centre after the parade. In previous years, crowds of up to 3500 people have gathered to try out their Irish dancing moves. As well as showcasing some of Ireland’s best traditional Céili bands, there’s always a line-up of new music acts and bands. The event is free to attend and is fun for all ages. The Cobblestone, North King Street, Dublin 7 > One of Dublin’s best kept secrets, The Cobblestone is a traditional, unpretentious city centre pub that plays host to some of the best traditional music and roots sessions in all of Dublin. O’ Donoghue’s, 15 Merrion Row, Dublin 2 > Ever since the 1960’s, O’ Donoghue’s has been synonymous with Irish trad bands including The Dubliners and the Furey Brothers. Both used to play regular sessions in the pub. Not much has changed over the years, including the interior of the pub, which still retains all of its original features. These days, traditional Irish music sessions take place on a regular basis and are very highly regarded among musicians. The Oliver St John Gogarty, 57/58 Fleet Street Dublin 2 > Set right in the heart of Dublin’s tourist hub, Temple Bar, The Oliver St John Gogarty plays host to daily traditional music sessions on the first floor. These are epic events – many begin in the early afternoon and last until 2am. Ballad singers also perform regularly at its smaller Library Bar. About the Author: Fiona Hilliard is a Dublin-based travel writer and blogger, follow her latest posts on Twitter @FionaHilliard. @Sara, next year I want to hear YOUR experiences! 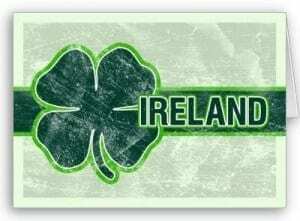 That would be such a dream to be in Dublin for St. Paddy’s day. I was lucky to have something green to eat yesterday. LOL. Happy escapes, Andi! p.s. I am so jealous that you already finished with spring cleaning! @Lynn, I have never been to Ireland but St. Pat’s seems like a good time to go! @Jen, hello my friend! I am glad you enjoyed it!